Searching for leading drain repairs in Guildford and Surrey, South East Drainage Services are the team to trust. Our dedicated and friendly family team can deal with blockages, inspections, repair work, and many other drainage issues. From our base in Guildford, we can travel anywhere in Surrey, providing a same-day emergency service, wherever you are. We are experts in clearing and repairing drains. So if you require drainage service in Guildford, contact us today. For reliable drainage service in Guildford, call upon our expertise to help. If your drain gets damaged, you soon know about it. The smell can be overwhelming and, when it creates a blockage, the mess can be catastrophic; this is why fixing these problems quickly is so important. We have 15 years of experience at fixing broken drains of all sizes, we are the ideal choice for drain repairs in Guildford. We have the equipment needed for all sizes of drain, and the skills to fix problems quickly. Call us today for our leading drainage services in Guildford. As the leading drainage contractors in Guildford, we pride ourselves on our outstanding service. Whether you need a CCTV survey of your system or simple blockage removal, we are on hand to exceed your expectations. We always leave your site clean and tidy, priding ourselves on a thorough and hygienic job. And, with competitive rates, you can be guaranteed of number one drainage services in Guildford. 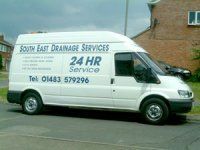 If you are suffering from blocked drain in Guildford, make sure that your first call is to South East Drainage Services. For drainage services in Guildford, call our team today for a quote. We promise to be there promptly so call our friendly family drainage engineers today. You can reach us on: 07939805521 or email us using the form on our 'Contact Us' page. From pressure jetting to drain repairs in Guildford, call your premium drainage contractors in Guildford.